This article describes how to customize the Challenge Response message and its confirmation URL's in case of multidomain configuration. 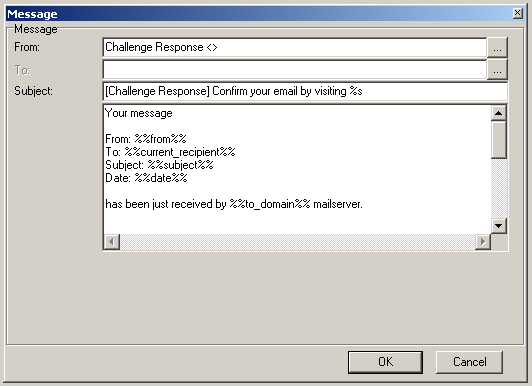 The Challenge Response section is found under Anti-Spam > Quarantine. You are running your Web/Control Service on a port other than 32000. Then change the port number accordingly. You are running a multidomain configuration with a virtual host for each domain. This is discussed at the end of this section. The Sender field sets the SMTP Sender address. Again it is recommended to leave it as default, blank. Use of this parameter can cause a loop between your servers whereby each server keeps auto-responding to the other. Fill in the From and Subject fields as you would like recipients to see in their e-mail clients. Edit the message body to meet your needs. Variables can be used as shown above (enclosed in '%%') and the %s variable can, and should, be used to display the URL the recipient must visit. This is evaluated to the URL set in the customization dialog. If you host multiple domains you may want to customize the Challenge Response URL with the %%Recipient_Domain%% variable.